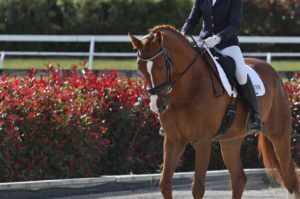 Perfecting your posture when your in the saddle is not just about creating a pretty picture of a seasoned dressage rider. Creating a neutral spine is about creating proper alignment so you can move freely with your horse without inflicting undue wear and tear on your joints. A neutral spine is vital for you to have proper biomechanics when you ride. This means all your ligaments and joints can be inline so your body can work efficiently at absorbing the horse’s movement. Without a neutral spine, you create areas which are more susceptible to injury due to the sheer force of the movement underneath you. If your spine is in a poor position you can’t create a safe and strong position to stabilize hips and pelvis, therefore, affecting how your body moves with the horse. This then shuts down the chance of your horse being able to swing and move efficiently from the hind legs through to the front. To protect and support your body, it’s important we stack your spine up so your body can work optimally. In doing so, you’ll be more stable and more functional. 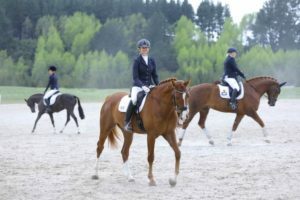 As a rider, this will result in a better connection with your horse as you’re both able to move more freely without being blocked. In this video above, I demonstrate how you can easily work on generating a neutral spine in a matter of minutes. Firstly, get yourself a mirror or a reflective surface such as a window, so you can view your posture as you do this exercise. Position your hands parallel with each other: one at the base of your rib cage, just under your bra line, and the other at your pubic bone. You’ll notice that the parallel position of your hands depends on your posture. Lean too far back with your shoulders back or hunch too far forward and your alignment is compromised. The key is to consciously stack your hands parallel to each other. When they are even, you’re able to close the gap between your rib cage and your hip bone so your abdominal area is braced. Bracing your mid-section is vital to protect your spine and maintain its stability. If establishing a good lower abdominal connection is difficult for you, be sure to take a look at the video which focuses on engaging your lower abdominals. Now, when we’re riding it’s important to keep our shoulders back. I like to think of it as putting a smile across my collar bone. So consciously think of spreading across and opening up your shoulders, while keeping your ribs down and stacked above your hips so that your spine maintains stability. Another way to help you stack your spine is with this visualisation. Picture two water bowls: one wrapping around your ribs, and the other wrapping around your hips. So as not to spill the water, you want these two bowls to be stacked evenly above on another. The more you practice this posture in front of a mirror, the more natural and familiar it will feel to you. Creating a neutral spine isn’t just reserved for when you’re riding. You should maintain this posture when you’re working around your horse, like lifting bails and feed, to give your spine the greatest protection possible. Even when you’re sitting in your office on your chair or while you’re driving your car; consciously stack your spine and create a neutral posture. 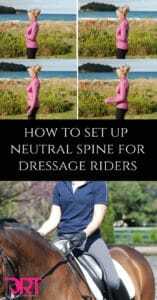 Once you understand the feeling of having your body stacked neutrally, you can then apply it when you’re on the saddle. You’ll notice this will help correct your arch if you tend to lean back or hunch if you find yourself leaning forward as you ride. Creating better body awareness is so powerful when you are riding. Knowing where you are in the space and how your body is positioned will help you improve as a rider. Now each of these steps are vital in order for you to set up a solid and strong neutral spine. Practice these on and off the horse and make it part of your daily routine. When you are driving, sitting at your desk and doing a workout, this neutral spine should be carried with you. The more you do this, the more second nature it will become and the better your riding will be as a result. For more information on how you can improve your core strength and fitness check out our dressage rider program. All the workouts, education and information you need to become a fit, strong and healthy rider. 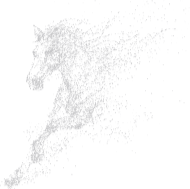 Take your dressage up to the next level by becoming the best rider you can be. Best of all, this can all be done in your living room. Learn more here.